Provides continuous cold therapy to the knee area for acute, chronic, or post-surgical applications. Cryotherapy can reduce pain and swelling. Available in a sleeve and wrap design. The Knee Sleeve measures 12"x13". The Knee Wrap measures 11"x12". Both fit to approximately a 30" thigh circumference. DonJoy® offers a complete line of cold therapy products ranging from motorized continuous icing devices to reusable ice wraps. We have a cold therapy product to meet any application from post surgical total joint replacement, arthroscopic surgery to more common injuries such as sprains and strains. DuraSoft® is a unique blend of segmented, body conforming pillows of water combined with a non-toxic soft gel, enclosed in polypropylene bags. When frozen, the water pillows function as actual ice providing cold. An absorbent powder is mixed with water to provide a soft component that allows coverage, compression and comfort for cold applications. Shop our complete selection of knee braces and sleeves here. How many insert do you need for one wrap? Does this wrap provide ice to the front and back of the knee at the same time? Thank you for your question. The wrap will provide cold to the front and sides of the knee. Due to the path your nerves run behind the knee, ice is not usually recommended there. I am looking for the soft, blue fabric that is used to hold the ice packs. I am doing a start-up business for dog clothing. The fabric would be very helpful in affixing the Velcro to on a squirming dog. 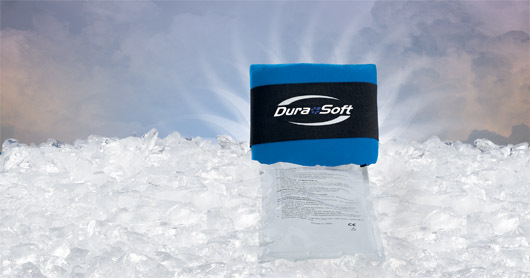 The Dura-Soft/Kold is sold with Ice Inserts. Please see the link below. does the don joy dura soft knee wrap around for $64.99 include the ice packs or are those separate and if separate, how many need to be ordered per wrap around. If you go onto the Better Braces Website, you may select either the Wraparound or the Knee Sleeve version. Price is different between the two. I suggest purchasing the 2 inserts, because we don't sell the ice inserts individually. If you lose one or need a replacement, we sell them in packs of 12. I suggest purchasing the Knee Wrap or Knee Sleeve with 2 Inserts. Can you heat this product? No, this item is not designed to be heated, only for cold. What is the difference between the Knee Sleeve and the Knee Wrap? The Knee sleeve pulls up on your leg like a sock. The Knee wrap will wrap around your leg like you would wrap a towel around your body. Cons: Doesn't appear the sleeve will last more than a month. Pretty crappy based on the price. I love the sleeve as this is the second one I have purchased but the two ice inserts get too hard. I can't form the sleeve to my knees with a flat sheet of ice. It should be soft gel I think. This product is great for after having surgery it helps minimize pain and swelling. It's great to because it keeps the ice packs in place so you don't have to worry about them falling off. ave had a knee replacement and a knee revision. Indispensable to control the inflammation. I LOVE my wraps!! I've had 2 knee surgeries in the last 3 years. And, these have been a lifesaver. Easy to use. Stays in place. The ice packs are somewhat rigid. Which works well for me. I just take them out of freezer. Loosely wrap around my knee. In 10 minutes or so, the pack loosens up & is super-easy to wear. I love that the velcro makes the wrapping so easy. They help tremendously with pain relief. So BUY! Which works well for me. Pros: Provides fast & long-lasting pain relief. Easy to use. Well-made. Stays in place very well. Super-adjustable!